It’s no secret that computers and phones collect information about you. If you’ve been searching something online, you’re likely to get recommendations based on whatever that item was the next time you go on Amazon or eBay. That’s not too much of a problem for most people but we constantly hear people talking about how the government are constantly tracking your phone and listening to your conversations. That’s not likely, but with so many crazy rumours flying around about online surveillance, it’s hard to separate fact from fiction. It’s true that companies like Google are storing a fair amount of information on you but it’s mostly used for advertising purposes. There are even directories that sell some of the information that’s been stored about you online but, again, it’s just used for adverts most of the time, not all of that sinister surveillance stuff you hear stories about. Companies can give your information to the government but they can’t just ask Google to hand over your emails because they’re curious. It’s only used in cases where that information could help to solve a crime. The number of requests for information that are put in is very small and not all of them are even granted. At the minute, the worst thing that you need to worry about when it comes to internet surveillance is some very specific advertising. However, some people are still worried about the amount of data that companies are storing about you, especially amid increasing concerns about the security of our tech and its vulnerability to cyber-attacks. If that’s you, there is a way to delete yourself from the internet. Facebook and Twitter are the perfect information gathering tools because you’re willingly putting personal details about your life on there. Your social media accounts are the best place to start when you’re trying to erase yourself from the internet completely. Deleting the accounts isn’t a huge problem. Just go into your setting and find the deactivate your account button. They tend to hide it right at the bottom of the page in tiny letters but it’ll be there. Then they’ll give you a grace period in case you change your mind. 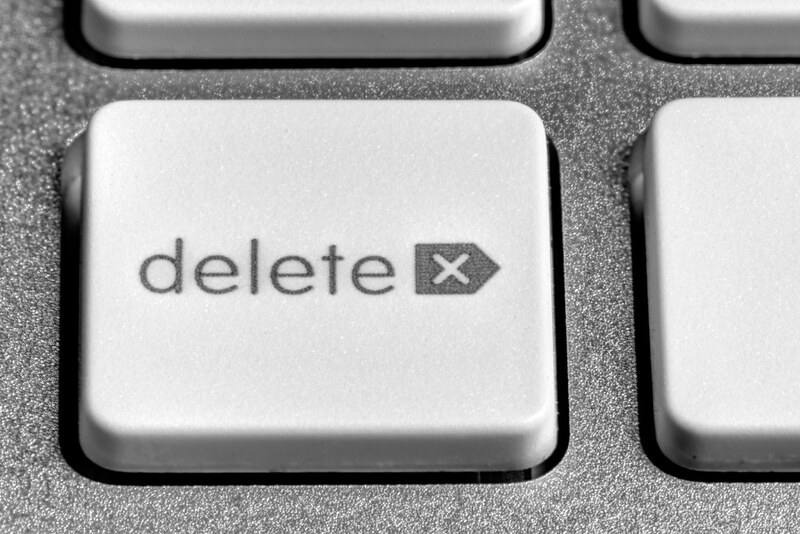 Here’s a quick guide on deleting your accounts. The problem is, once you’ve deleted the account, that doesn’t necessarily mean that they’ve deleted the information they’ve got stored in their archives. They’re legally obliged to delete all the information that they hold on you so you just need to get in touch with them and put a request in. As long as the data isn’t held for any kind of legal reason, they have to delete it for you. However, getting in touch with the right people isn’t always easy. Try to find the general customer service number and see if they can direct you to the right people. When you’re trying to get rid of information that Facebook has about you, it might be a bit trickier. The contact details for Facebook are notoriously hard to find and there are only a couple of sites that have access to the real Facebook phone number. The one that you usually find when you search it online is just an internal number at their office, not a customer service one. You’ll have to go to one of those sites and put your questions in through them. As well as all of the ones that you use now, check any old ones you used to use, even if you haven’t been on them for years. Everybody always remembers to clear their social media accounts but they often forget that there are loads of your details on shopping sites. You’re going to have to try to remember all of the sites that you’ve ever bought stuff from and go back through them and delete all of your accounts. If you’re a prolific shopper then you might struggle with this a bit. If you’ve bought from hundreds of different sites over the years it’s unlikely that you’ll remember them all. In that situation, you might have to pay a company that deletes your information for you because they’ll have the resources to find all of those accounts from years ago that you’ve forgotten about. Buying and selling your personal information is a whole industry of its own these days. Advertising companies are desperate to get as much detailed information about you so they can build a profile and target adverts that you’re most likely to respond to. Data collection sites will pick up this information from anywhere they can and pass it on to the highest bidder. The sites are searchable so you can go on, find yourself, and delete it manually. The problem is, there’s a lot of these sites out there and finding them all is a big job. You’ll also have to keep checking them regularly to make sure you haven’t been added back on. Luckily, there are companies out there that can do it for you. It’ll cost at least $100 a year but if you’re serious about remaining anonymous then it’s worth it. They’ll look through all of the known data collection sites and remove you. Then they’ll check back every few months and ensure that you aren’t getting added to more sites. This is a final step for people that are adamant that they don’t want any of their details whatsoever floating around online. It can be a bit of a pain for most people because they still need to use emails on a daily basis but if you can do without and you want to remove the last traces of yourself from the internet, get rid of your email accounts. Depending on which email accounts you’ve got, it can be difficult. Make sure that you always do this last because you’ll need to use your email to delete the rest of your accounts. Most email accounts will stay active for a couple of weeks before they’re deleted completely. These steps should remove all known traces of you from the internet, however, there might still be bits and bobs stored in the caches of the sites but nobody will be able to see them online. Next Post: Blackberry buying Cylance?